06/10/2014 Once again, students from Chalmers University of Technology in Gothenburg have created a winning prototype race car for a series of international student races. The Swedish team achieved excellent results in both the UK and Germany in a vehicle fitted with custom-made Lesjöfors chassis springs. 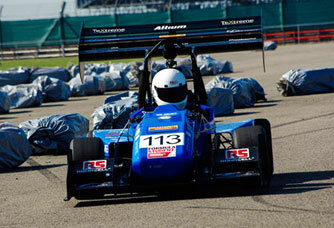 Each year, Chalmers students compete against teams from 75 European universities in the ‘Formula Student’ international race car competition. Students are given the task of building a race car for competitions all over Europe, where the vehicles are judged in various categories before a final winner is selected in each category. In the UK competition, the Chalmers car reached the top six in the design category. The car was fine-tuned for the subsequent German competition, resulting in an honourable third place overall finish. Lesjöfors Industrifjädrar in Herrljunga has sponsored the Chalmers team for many years with custom-made chassis springs. "It's inspiring to be involved in the development of new products together with future engineers who often think outside the box and question things in a new way. Furthermore, the development of an advanced product with limited budget means that Lesjöfors as a sponsor is an important key to success", says Niklas Movitz, Key Account Manager at Lesjöfors Industrifjädrar. "Vi växer och utvecklas på alla plan"